Wood can be turned into Lumber at Galawi. Lumber can be used to construct houses. 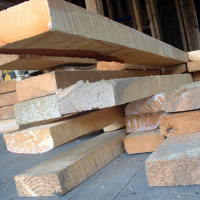 Lumber is a term used to describe wood, either standing or that has been processed for use—from the time trees are felled, to its end product as a material suitable for industrial use—as structural material for construction or wood pulp for paper production. In the U.K. and Australia, timber is a term also used for sawn wood products (that is, boards), whereas generally in the United States and Canada, the product of timber cut into boards is referred to as lumber. In the United States and Canada sawn wood products of five inches diameter or greater (4½″ nominal size) are sometimes called timbers. Can be bought at The Wood Shop in Rissdra for 4 Vessi each.